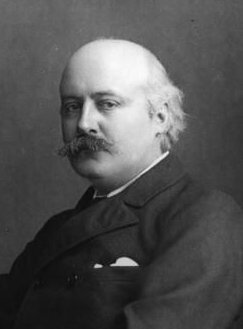 Sir Charles Hubert Hastings Parry was born on the 27th February 1848 in Bournemouth, the son of a wealthy amateur artist. He was educated at Eton and Exeter College, Oxford. Coming from a wealthy background and marrying a rich wife he never needed to earn his living. None the less, he joined the staff of the Royal College of Music in 1884 and was appointed its director in 1894, a post he held until his death. He had great personal charm and was a highly successful teacher of composition. Among his pupils were Vaughan Williams, Gustav Holst George Butterworth and Herbert Howells. Holst said of him "At last I met a man who did not terrify me. He gave us a vision rather than a lecture". In 1900 he succeeded John Stainer as professor of music at Oxford University, a post he held, concurrently with the directorship of the Royal College, until 1908 when he retired on the advice of his doctor. He died on the 7th October 1918 and was buried in St Paul’s Cathedral. Parry was particularly influenced by Johannes Brahms, for whom he wrote a choral and orchestral elegy in 1897. He adopted a powerful tonal style, and established an English choral and orchestral tradition that greatly influenced later composers such as Elgar and Vaughan Williams. He was a major force in establishing art music at the centre of English cultural life. He was widely regarded as the greatest English composer of his age. Edward Elgar said of him "he is our leader, no cloud of formality can dim the healthy sympathy and broad influence he exerts upon us" and Ralph Vaughan Williams declared "Amidst all the outpourings of modern English music the work of Parry remains supreme". However, after the end of the first world war his work fell from favour in a general reaction against the bombastic Edwardian era, and now his reputation rests principally on his famous setting of Jerusalem. The third symphony was completed in 1889, and was first performed in a Philharmonic society concert on the 23rd May, conducted by the composer. It was an immediate success, and, until Elgar's first symphony was premièred in 1908, it remained the most performed work of any English composer. The subtitle "The English" refers to the melodic and rhythmic character of the themes. Parry makes no direct reference to English folk music. Structurally, the work follows the models of Beethoven and Mendelssohn, though its scale and orchestration place it firmly in the late romantic era. The first movement is in sonata form, though without the repeat of the exposition. It has an energetic dance like character. The andante is a ternary form movement in the relative minor key. In contrast to the first movement it is introspective and nostalgic in character. The third movement is a scherzo and trio, full of drive and energy. The last movement is a set of fifteen variations on an eight bar theme. In the short coda Parry alludes to the thematic material of the first movement, bringing the work to a cyclic close. Parry's third symphony was performed by the Portobello orchestra on the 12th July 2008, conducted by Anthony Weeden.